Germany is about to end her 90 year history of operating Schnellboote or Fast Attack Craft. The remaining units of the 143A class are about to be decommissioned as new corvettes K 130 finally reach fleet acceptance. From small beginnings in WW1, the Schnellboote have developed into very potent small warships, with the 143A's the epitome of this development. In NATO, Germany was tasked with denying the Soviet Fleet to leave the Baltic. To this end, the Bundesmarine (Federal navy, since our reunification Deutsche Marine – German navy) built and operated a succession of Schnellboot classes with a view to surprise attacks on enemy shipping. Earlier classes were an evolution of WW2 designs and armed primarily with torpedoes and AA guns. The introduction of guided missiles seriously increased the punch the vessels could pack, and the distance at which they could strike. The first guided missile boats, armed with the French Exocet, later to gain notoriety in the Falklands war, were the class 148. They were succeeded by the class 143 which was built in two sub-groups: Apart from the four Exocets common to both, 143 was fitted with two of the standard 3 inch Oto Melara guns, plus two torpedo tubes, whereas 143A received the RAM close range defensive missile system instead of the second gun turret and the torpedo tubes. After Germany's reunification and the resulting reduction in fleet size, the 143A vessels were retained and modernized while the 143's were sold off. With Germany changing her policy to participate in international military operations, the 143A ' s were deployed in areas and climates they were never designed for – operating off Lebanon and Djibouti in conditions seriously taxing the crew's endurance. As the threat environment and required warship capabilities changed, the vessels lost their original mission and are hence being replaced by slower ships with a longer endurance. Nonetheless, these vessels have rendered an excellent service over the course of almost 30 years. 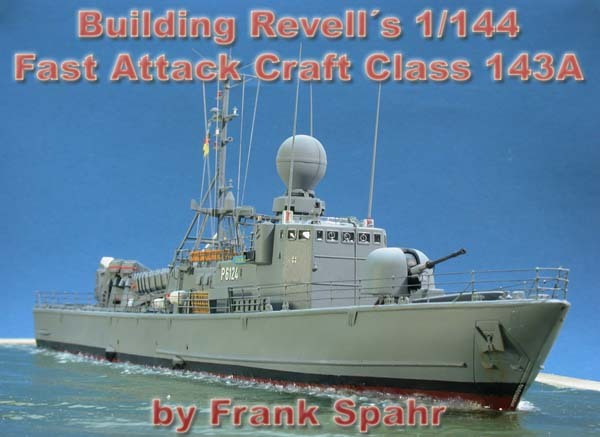 Revell has produced kits of the 143 and 143A class in the early 1990ies, and after a hiatus, the latter kit has been re-issued in 2008. The kit is a very faithful and credible reproduction of the well documented vessels for the time of its first issue. Modifications applied to the vessels after that date need to be retrofitted, as they are not included in the kit. The parts are well molded, though not without some sink marks. The plastic railings are oversized and could benefit from replacement. A nice and comprehensive decal sheet is provided with some very useful stencils and markings for all vessels of the class. Flags are provided printed on paper. Revell's typical clear multi-step instruction and their well known paint references to their own brands only complete the kit. I was landed with this kit like the proverbial virgin with the child. A friend of mine had persistently asked for someone to review the kit, and had met less than lukewarm responses. Upon a meeting in Hamburg, he brought the kit and placed it into my not really open but rather reluctant hands. Upon opening the box and sifting through the sprues, I pretty soon developed a fondness for this model, overcame my reluctance, agreed upon reviewing and even building it, even on the fast lane and speeding past the several dozen unbuilt kits I have at any given time. Pawing the sprues, one of my friends exclaimed: "Look here, they even have an Oscar!" Hey, I'm a card carrying landlubber, so I was entirely clueless about what the name meant in this respect. Oscar turned out to be the name all the man-over-board-drill-dummies have in our navy, and he was present dangling from a mast bracing next to some fenders. Not without sink marks and looking like a cross between a deep diving suit and a fighter robot from the 1950's, but there he was, ready to be thrown overboard and be retrieved by the crew. By the way: Later on I learned that the Royal Navy uses the same name for their dummies, so I assume we adopted it from them. I almost immediately saw an oscar-themed diorama made from this kit, so I started reading and asking questions over the next weeks. On the one hand, I wanted to identify what improvements the kit needed, on the other I wanted to learn more about the drill Oscar was used for. Klaus Gaeth of www.schnellboot.net kindly provided images of an Oscar drill, thanks a lot for your help! My friend Guido Hopp had visited one of the vessels during an open ship and had taken a number of very helpful images which he provided to me – thank you, Guido! Olaf Rahardt's volume on the 143's "Schiffsprofile Nr. 11" included a huge amount of useful information and was duly bought. As Guido had visited S 74 "Nerz" ( German for mink) I decided to model this vessel. Luckily, "Nerz" has a website with extensive image galleries which proved very useful to fill the gaps in my other references. I started by assembling the entire hull including the deck. Some putty was used but not overly much. I tend to prepare my seascapes in this early stage as long as the hull is uncritical to handle. For my diorama, I had decided to show the ship's inflatable boat returning with Oscar after picking him up. So the vessel herself would be slowing down and the inflatable approaching her from port and astern. So I cut a piece of 30 mm foam board (insulation board from the hardware supermarket) to fit into my standard IKEA picture frame, and made a cutout for the hull. An old bread knife works well for this task. Remaining gaps were filled with acrylic filler from the hardware supermarket. For this step, the hull was insulated using vaseline. A slight swell was produced by cutting and sanding the foam board material. The disturbed water astern the vessel was enhanced by carefully spraying paintbrush cleaner to the base – make sure you have good ventilation and don't overdo it, as the stuff eats into the base and melts it, if used too copiously. The area for the inflatable was identified and prepared by sanding and slight spraying of paintbrush cleaner. Now the base was painted with ordinary white wall paint, using a large brush in a stippling motion. This seals the surface where needed and achieves the slightly irregular surface crucial to the final water effect. After drying, Revell Aqua Color #68 was sprayed to give the base the hue of the Baltic on an overcast day. All the disturbed water was drybrushed with white paint. That fully dried, the base received several coats of solvent based clear gloss lacquer from a hardware supermarket rattle can. This gives the right gloss and reflection to the base. Any further wave effects were achieved using layers of acrylic gel and white artist's oil paint. Finally, the base was ready to mount the 143A and the inflatable. Returning to the vessel, I sifted through my references to find out what to change and what to detail. The size of the model and the number of subassemblies eased parallel working on a number of them. I started by replacing the rather featureless bases of the Exocet launchers, which originally are a sort of latticework construction. To build these parts from styrene stock, I needed multiple parts neatly cut in identical lengths and angles. To achieve this, I bought "The Chopper II" by NWSL, a very useful cutting tool. Thanks to Andreas Nickel of www.anfatman.de for providing this (at the time) hard to find tool. After removing the molded on bases and plating the holes in the deck over, I built four of the bases from styrene, each of them comprising about two dozen individual parts – quite a lot of work, but definitely worth it. The missile canisters themselves were further detailed as per reference images, adding their hinge mechanisms. The two aftermost canisters received blast deflectors. Even though what I did is not entirely correct, I feel it is an improvement over the kit parts. The RAM launcher was only detailed with some PE parts for steps and handholds. The blast deflector right ahead of the launcher was detailed by drilling some holes and adding loudspeakers. The numerous molded-on fairleads did not look sharp enough, so I replaced them by scratchbuilt items. The gun turret was built almost OOB – I added steps leading to the access hatch and the handwheel to open the hatch. The latter was taken from an old and OOP PE sheet by Scheuer & Strüver. The gun barrel was carefully drilled open, and a wire was added to it. The superstructure was prepared as a subassembly to ease painting. It needed some filling and sanding, plus some modifications per reference images. The molded on vertical ladders were removed and replaced by PE items. The picnic bench was detailed using styrene stock. The most notable addition to the superstructure was the infrared sighting system MSP 500 which was scratchbuilt using PE and styrene stock. At the bridge front, the blast pipe of the pre-wetting system was added using soldering wire. The bases for the rather massive antennas were also added. Now came the time of painting the model. Acrylics were used throughout the build. After discussing the scheme with a naval officer friend of mine I settled for Revell 57 for the vertical and 79 for the horizontal surfaces. I rather masked and sprayed the boot topping with Revell 9 than tried using the kit decals. The lower hull was sprayed Revell 37. I relied upon reference images for the paint demarcations, especially on the superstructure. I had wanted to engrave the red warning circles to the deck, but ended up with cutting masks and spraying them. When it came to "marrying" the superstructure to the hull, I ran into trouble. Despite all the dryfitting and removal of interfering locator pins I had done, it wouldn't fit. So I had to apply serious pressure and still ended up with annoying gaps to fill. Having completed that, I further detailed the superstructure. Some boxes for fire fighting equipment were added, with the typical labels designed and printed to size. I also added a "bridge art" I had seen in some reference images, a mink riding two missiles. I have no idea about the correct time frame for that, but I liked it and included it anyway. As in any project, there was a time when I thought I'd never get through cleaning up and painting all the small parts I had yet to add, especially as more of them popped up when looking through my references. So I added a bitt and another pre-wetting blast pipe with its protective wire frame to the stern. Now came another visible addition, the boat crane for the inflatable boat. It was built per reference images using styrene stock and generic PE. L'Arsénal's "Structural Parts" were again most helpful here. The open bridge received a wooden railing quite visible in the references, plus "optics" for the sighting instruments in the bridge wings. As mentioned before, the kit decals are very nice and helpful, they also contain some stencils for the bridge and some for the RAM launcher. The original masts are very intricate and complex designs. The more I looked at the references, the more I realized I would only be able to hint at their complexity. So they were detailed moderately using styrene and wire to improve the overall look. On the main mast, some antennas and a signal yard with PE eyes were added, and the plastic ladder was replaced by PE. Having completed the radar mast, it was glued to the model and I was able to begin with the railings. To replace the oversize kit railings, I had bought PE stanchions of the required height and number of holes for the bars. Saemann has very useful PE parts for projects like this, highly recommended. Following the principle of working from the centerline of the model to the periphery, I started on the superstructure railings. Stanchion positions were identified and drilled, and the stanchions were then superglued. The vessel has both sections of railing with sturdy steel tubing and easily removable sections of railing with wire. Both sorts are present on the superstructure. As the holes in the stanchions are .3 mm in diameter, I had planned to use .2 mm brass wire for the wire sections. That worked fine and looked to scale even when painted. The larger diameter sections were individually cut and glued between the stanchions using .5 mm wire. That proved to be a lot of work, but looked convincing, too. Inclined bracing's were added from .3 mm brass wire. This wire was also used on the trickiest parts of the railings, those surrounding the life raft canisters on the main deck. Here, I carefully enlarged the holes in the stanchions to accept the stronger wire, and then bent three hopefully identical wire sections to shape. These were carefully threaded on the required number of stanchions, and the whole wibbly-wobbly assembly then glued into the pre drilled holes in the deck. Once glued, the railing was very sturdy throughout the ship. Right ahead from this part of the railing, three items had to be scratchbuilt on both sides of the vessel – a gangplank, a scrambling net and a box of - to me - unidentified purpose, in short a BOUP. My stock of styrene, PE and wire helped a lot, and surplus material from a screen door was well suited for the net. Building the rest of the railing was time consuming, yet not hard. I was pretty happy with the result in all its brass glory. Brush painting the entire assembly proved to be tedious and I needed several correction runs before the paint covered all the brass. Using a darker shade for the wire railings, I got pretty close to the look of the real thing and have to say this is the best looking railing I have built so far – in my eyes, obviously. Having come so far, I added the remaining mast and the bridge roof antennas. For the latter, turned brass items from BMK for masts were used. The transparent plastic casings were simulated using the clear protective plastic from new paintbrushes. A ship in a diorama needs a crew – so I had to find about a dozen crew figures visible on deck and aboard the inflatable. I had once bought a large bag of spectacularly ugly and garishly painted N-scale figure which I use for conversions like this. They were modified and repainted for enlistment in Germany's navy. Care was taken to let all of them do something that was credible in the situation depicted. Having glued the figures to the model, I added some minimal rigging in the shape of signal lines. Tan fly fishing thread was used. Having brought everything together now, the model was sprayed with Vallejo ModelAir's excellent matte varnish to blend things in and hide embarrassing glue marks. The model was weathered only minimally, as German navy vessels tend to be very well kept. I just added some slight traces of rust on and below the anchor. Prior to gluing the model to the diorama, the last task was to add the bridge glazing. Here, MicroScale's Kristal Klear was used – a transparent white glue which is superior to our German white glue brands. The final touch was to add centrifugal disks to the three middle bridge windows. They are included in Revell's decal sheet, but I didn't like the option, so I made my own versions from sections of brass tubing and PE oars. These were glued and sprayed, and inserted (with bated breath, obviously) into the fresh Kristal Klear, hoping that the glue's surface tension would suffice to hold them in place. The result looks worth the effort to me. That cured, the vessel was glued to the base using dabs of silicone caulking applied from below. Any remaining gaps were filled with acrylic gel. Despite some fit issues, this is an excellent kit of an attractive vessel the rendered services her designers never would have imagined. It is well detailed from the outset, and its large scale and the abundant references ease improving it a lot. No matter whether you build the kit OOB of however detailed, I can but highly recommend it to you! Build time @ 150-200 hours. - Olaf Rahardt: Schiff Profile Nr. 11: Schnellboote Klasse 143 / 143 A; Stengelheim 2006. More of Frank Spahr's work.